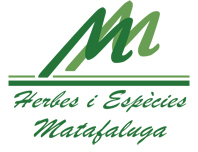 Matafaluga Management was founded in 1992 in Sant Feliu de Codines. After 26 years, now based in Caldes de Montbui, we are a reference in the distribution of herbs and spices in Catalonia. We serve butcher’s shops, fruit shops, grocery stores, as well as many restaurants and gourmet shops. From herbs and spices, to seawater, through dried or canned mushrooms, honey, organic olives (and derivatives such as organic olive oil), nuts, cereals, gluten-free stews, pâtés, caramelized sesame, organic juices, jams, sauces (allioli, romesco, xató, calçots…), pasta, dull brown sugar. We are also the official distributors of the brands: La Barraca, Bionsan, Conservas Coll, Ordi Natura, Delizium, Casa Pau, Kromenat, La Moianesa, Capell, Zara, Ebre, Cooperativa Foment Maialenc and Can Galderic.